This pale, oatmeal-coloured cashmere is my new favourite sports-jacket material. or a pale-grey cashmere (like my recent Steven Hitchcock commission). But if this is a smart office, where we’re replacing grey and navy suits, then the next colour options – primarily brown and green – can be a little too rustic. Even muted browns and greens – like my Rubinacci donegal or Solito escorial – might not be smart enough. It’s just hard for these essentially country colours to be formal. Oatmeal, or beige, is easier. If this colour has any associations, it is with the linens of summer. But the texture of the cashmere, and some cream in the weave, elevate it above those casual, wrinkled jackets and make it look much more luxurious. Indeed, this biscuity tone might even be more useful than grey – because it can go with grey itself. The big issue with grey jackets is they can’t be worn with grey flannel in the winter, or grey fresco in the summer. Oatmeal doesn’t have that problem. The cloth is Loro Piana 499019 from the cashmere jacketings bunch. It is 320 grams (11 ounces) and 85% cashmere, 15% Super-170s wool. The latter gives it noticeably more body without making it feel any less soft. Pictures taken in the atelier of Maison Bourgeat glasses, Paris. You can follow the discussion on Your next sports jacket: Oatmeal cashmere from Elia Caliendo by entering your email address in the box below. You will then receive an email every time a new comment is added. These will also contain a link to a page where you can stop the alerts, and remove all of your related data from the site. You said somewhere that gray doesn’t work quite as well in linen. Do you really think that’s true, and is it something that could be extended to summer jackets in general? Thanks, Simon. Probably start with a nice grey and what a great excuse to experiment with trousers. One of your best, beautiful fabric and cut. Nicely photographed as well. It is a great piece. Lovely jacket, really..
Can I ask how much D’Avino charged you for it? Elia Caliendo made the jacket. Or did you mean D’Avino for the shirt? Yes, I did. Sorry for the confusion, I haven’t had enough coffee this morning..
That is a fantastic looking jacket and looks great on you! I almost had made it the same cloth and now I’ve seen someone actually style it, I may still take the leap. I think I would have styled it exactly as you have! Very nice indeed. If you don’t mind, could you please share what Elia charges for this jacket? On an aside, the colours in the photos don’t do the garments justice – the trousers look almost grey but it could be that my monitor needs colour calibration! Elia charges just under 3000 euros for this jacket. The trousers are a very greyed green, yes. It’s a Holland & Sherry flannel. Grey at first glance but definitely green on closer inspection – my favourite thing, subtlety! Beautiful colour but doesn’t skin tone come more in to play with a colour like this ? I’m thinking President Obama and the tan suit he wore and got more coverage then anything he said at a press conference . A little bit, but a jacket is less an issue than a full suit, and you can change a lot with the shirt and tie etc. Thank you for this very interesting post. I think we are all going to reckon that this is a lovely outfit! Yet no matter how many posts you are going to dedicate to this specific area of menswear, the whole topic is going to remain puzzling, I’m afraid. For instance, if I had no idea of the fabrics involved in this outfit, I would have thougt of it as having been made for Spring or Summer. Indeed, anyhow I associate light colors with SS and dark ones with AW. And since I rather wear jackets more often than not, for Winter, for instance, beyond navy, brown and green are the colors I normally consider, expecting of course reaching the highest level of smartness achievable with those colors. Now you say in this post that there is no way to eschew their countrified bent. Thus my question: isn’t possible to escape this brown-green country association by resorting to appopriate accessories such as ties, color and fabric of shirts, trousers and last but not least shoes? Unfortunately, I couldn’t retrieve pics of yourself posted in the past to make the case for the suitability and smartness of brown and green jackets. But they do exist. You can certainly mitigate it with the other pieces in the outfit, yes. But for some business environments, they will always be a little casual. Eg I know lawyers who generally wear blazers on a Friday. A cream like this would look smarter than any brown or green. It’s an interesting point on colours. I don’t tend to think of them seasonally, at least in terms of jackets and trousers. More in accessories like hanks and ties, and even then it’s more on the sunniness or not of the day, rather than the season of the year. I agree with you Simon! And congratulations for the new sports jacket: elegant cut and oatmeal goes perfect for the semi-formal occasions! I wonder then if it wouldn’t be fairly helpful to distinguish formality from smartness. Take a look, for instance, at this pic where you stand beside Tommaso. In terms of formality, your entire outfit is perhaps less formal than Tommaso’s. But it is surely as smart as his. Presumably, there is a sliding scale of formality in the realm of jackets, starting I guess with navy Blazer, even though I’ve never seen its contours. Thank you for this clarification, Simon. I now fully understand the point you are making in this post. Doubtless many of you will have now taken delivery of the latest edition of the ‘Rake’ and are horrified that they have devoted multiple pages promoting the merits of Oxford Bags. What on earth is going on with that publication ? What will we have next, Harry Styles on the cover? Bizarre that attempts at quality men’s style publications always end in tears ! Sorry, but for me this colour has no place in a work wardrobe, however casual the environment. Oatmeal/biscuit is just not a proper northern European shade, and I’m not sure it would be seen in the wardrobe of a French, Italian, Portuguese or Spanish chap either. Chaqun a son gout etc…..
Couldn’t agree more with you. I started buying the Take for professional purposes but if they don’t sort out the rubbish they have published over the last two editions I for one am going to cancel my subscription. Lovely jacket Simon. What materials would you recommend for a summer equivalent? Pure cotton or linen always seem too wrinkly but would a blend wear cool enough? I like your thinking but I would have gone for something leaning more towards cream rather than brown. The other option is Armani ‘greige’ a mixture of beige and grey. However everything you say re. colour (green/brown/grey) is correct. Mixing neutral tones such as grey can be difficult, particularly as menswear utilises so few colours for trousers (beige/brown, grey, blue, green). Out of interest how does the Oatmeal match up with Blue and Black? Fantastic!! This is my next item to have made. I think the jacket looks fine albeit I don’t like patch breast pockets – for me they always look wrong. On another but aligned subject, I’d love you to do a piece on what I would describe as the louche suit, The sort of suit that would be worn by a Jazz singer or an artist or somebody who works in the creative industries or, who is simply too rich to care. A suit which could be worn for every aspect of everyday life with the exception of the formal office environment. One of my favourite style icons is Charlie Watts and I’m not sure he’s ever been near an office in his life unless it was under duress. I don’t agree that it’s a case of “dressing up”. It’s actually the reverse and is often a real study in the choice of cloth / pattern and adjusting small details to make the suit look more relaxed. When you look at how Charlie Watts wears C&M or how Ferry wears A&S they are great examples of this. A cord suit is a no brainer because the cloth virtually does it for you but move into other fabrics and patterns and that louche look requires more studying. David’d comments could be made about me! I love tailoring and am a self employed creative (sadly being too rich to care is not one of my problems). Green cord was my solution; great colour against pale flesh. I love cord suits; the chest on yours Simon has amazing shape. Bryan Ferry and Hugh Grant are two others who like louche cord. Lucian Freud’s scarf is possibly too idiosyncratic for others to pull off but nailed louche for me. I’ve just had a navy hopsack SB jacket made by Elia after your recommendation and I’m really pleased with it, thank you! I’m thinking about having this oatmeal jacket as my next commission, how would this jacket look with denim such as the Levis Kaihara? Looks nice with denim, given the casual make, but I would say the cream colour is a little smart. “The big issue with grey jackets is they can’t be worn with grey flannel in the winter or grey fresco in the summer..” I don’t like absolute statements like this particularly regarding clothes and find it a bit surprising to find it here – why do you think one can’t wear different shades or textures of grey together in a jacket and trousers combination? do you have any crap clothes? What do you wear whilst mucking about in the garden, or equivalent of? Simon, that lapel there is close to perfection. It has a nice thickness to it that is gives a very masculine appearance even though the jacket is of casual make. This style is typical of Elia I presume. The length of jackets may be deserving of comment please. Do you wear a (fairly formal, structured) jacket where the sleeve is longer than the body, and your backside is poking out beneath the ‘skirt’ (to use an old description)?! BTW the length of your oatmeal jacket looks spot on, but I’d prefer the sleeves a fraction shorter. No, never! Always cover the rear. Jacket should fall about halfway down your hands, or be roughly half the length of the whole suit. I think this is one of my favourites, it looks incredibly comfortable…is there much structure in the chest and shoulders, or is it completely unlined? If the latter, he’s done a very clean chest, which is not always easy.. While watching again your outfit, it dawned on me that you have indeed paired this jacket with green trousers. To me it looks really fine. But why would the green color stop shouting for country in this specific combo? 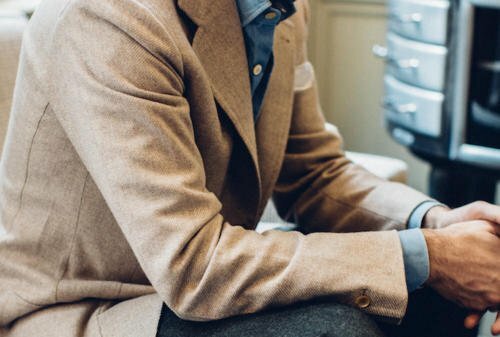 To stick to the level of formality you have in mind here – due to the environment – while maintaining a high level of smatness, I wonder whether you wouldn’t achieve both if the jacket were just paired with mid grey, say, flanel. Absolutely. This would be far smarter with grey flannel trousers. And a regular blue shirt rather than denim. The points are about the jacket rather than the outfit as a whole. Nice. I’m always wondering what an alternative color to blue is. And while gray is the obvious choice it is always a little limiting. One tailor I respect said the most versatile travel blazer for the cooler months was black cashmere. His argument is that it could be dressed down during the day and dressed up in the evenings and could be paired with just about any shade of gray trousers. But a summer alternative is perhaps a little harder. Does one stick with blue and change the weave or pick a pattern–a window pane, for example? This same tailor suggested a dark green worsted. Its association with golf notwithstanding, I think it’s a great idea. Both black and green blazers were meant to be worn with gray trousers. The green, I would imagine, could also be worn with a beige. These answers were given to my pestering about a blue blazer substitute. Which sort of begs the question: what is it about blue and gray that makes is such a hard and fast combination? 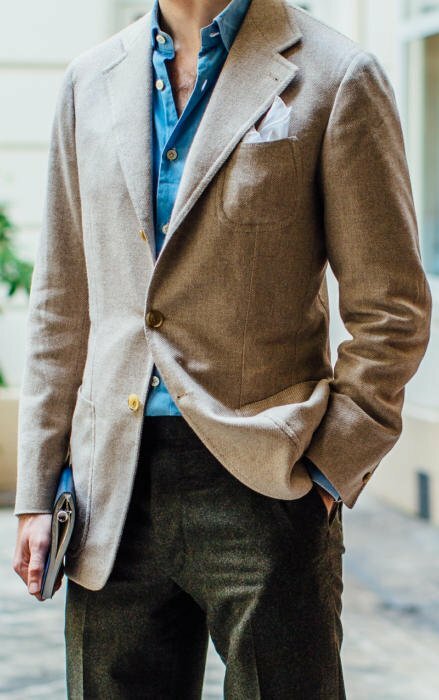 What would be so odd about wearing blue trousers with a gray blazer? I do not have to wear suits to work even though I work in finance and see a lot of clients. My “go to” outfit is blue blazer paired with grey trousers. In the summer months I will often wear cream trousers (although more for dressy social events than when visiting clients). In the cooler months the options expand: tweeds and flannels galore. But in the warmer months what really are the choices beyond the blue and gray? Sure, there are some nice window panes. But let’s say we were sticking with solids–where do go? By implication you dismiss the inverse (gray blazer, blue trousers) and dark green doesn’t seem to have tickled your fancy (I will post a picture of my the blazer when it arrives shortly). As always, your thoughts would be most welcome! Black blazer? Dark green .. worsted? Honestly, these are not colors you should be considereing for what you seem to have in mind. Take a look at past posts here. You could manage to come up with better ideas. Simon-your style is inspiring and very detailed really appreciate your knowledge and recommendations. What is your opinion on Bontoni shoes? Dear Simon, please advise me what amount of shirt cuff should show for tweed jacket sleeves? My RTW 4OR 3-buttones must be shortened; my shirt sleeve is 31″; the seamstress claims now after shortening only three buttons have room after shortening and she says the distance from shortened tweed jacket sleeve end to first button end cannot be 4cm, maybe maximum 3 1/2 cm. Please advise! PS: My inquiries to tweed jacket sleeve length and its relation to visible shirt cuff are in contrast to your lightweight summer cashmere jacket above with 1 sleeve button and no shirt cuff visible when arm held straight. Your Caliendo tweed jacket shows no shirt cuff!? – Where should the tweed jacket sleeve end? Can this be considered an all year round jacket or is it too warm for the hottest weather? Hello Simon! I greatly enjoy your blog and I’ve learnt loads from it. I’ve always had an interest in tailored clothing and this blog explores tailoring like no other. I’ve had a jacket made last year, and since I forgot to mention it, my odd jacket doesn’t have swelled edges. So, I was wondering if this is something that can be done later? Thank you in advance for your advice and time! I notice that the boutonniere hole has been cut in the same keyhole fashion as the buttonholes. Is that by accident or design? I thought the use of keyhole boutonnieres was solely restricted to the more ‘affordable’ end of ready to wear? I’ve noticed also that Elia doesn’t put a thread at the back of the lapel for the flower stem. Annoying omission, and annoying that I always forget to ask for one. Simon – congrats. This jacket is great. Looks effortlessly elegant. This prompted a few thoughts – how do you describe/define your own personal style? I just noticed the Sexton picture you posted on Instagram. It seems to be the diametrical opposite to this wonderful jacket. All great ensembles but they seem so different. Would be grateful on your views on wardrobe building this way – do you think it’s better to focus on one consistent “style” or to include as many as possible. However, I am struggling with a lighter grey jacket like in your Caliendo denim post, or a navy jacket. Are they really that versatile to be the top 2 odd jacket colours? Hey. I’ll do a separate ‘reader question’ post on this if that’s ok? Beat you to it Simon! The boys at Patrick Johnson in Melbourne made this exact jacket for me in precisely this cloth and in the same cut about a year ago. It is quarter lined with very little padding and three patch. I love it with dark green and brown cords and with a hefty creamish cotton. Unlike you I do wear it with grey flannel which seems to lend a little formality to it. We also appear to both have in the works a grey cashmere herringbone. Again, mine mimics yours in vut and colour but the cloth is Loro Piano. I’ll say hi to them for you on my next – of far too many – visit. Your website remains a precious resource to me, perhaps because I seem to have so much in common with what is featured on it. Thanks Rob, lovely to hear. One point – I do wear this with grey flannel. My point was that grey jackets can’t normally be worn with grey. No cashmere herringbone in the works. Perhaps you mean my Caraceni I had made last year? Simon, I think it is your grey cashmere which has already been made I was referring to…I have one in the same colour and style in cashmere being made up by P Johnston. Naturally they are MTM but I have a lot from them and have always been delighted with their fit. On the point about wearing a grey odd jacket with grey pants, I do this quite a lot – and rarely with charcoal pants…more mid grey pants, lighter grey cashmere jacket. There is an elderly Japanese guy at Pitti who I think is a master in subtlety. He pairs a grey herringbone jacket with flannel pants in the same shade. Only up close can you see its not a suit. This is of course unconventional but I like it – a departure from the view that there must always be strong contrast between odd pants and jackets. Just a different approach I guess. I’ve been following your site since it started. After having a very bad bespoke experience with Thom Sweeney I had a jacket made by Elia Caliendo exactly the same style and make as the SB’s you’ve had made and he has done a superb job for me too. I’ve also recently had an SB made by Solito. Could you tell me the difference in their styles and which you prefer? Thanks for the reply. I’ve found the Solito jacket to be shorter and much closer fitting. Is this your experience as well? Which maker has the best looking and fitting jacket out of the two in your opinion? I haven’t found that much difference in the style as I said. Perhaps Luigi fitted you more closely for some reason? One thing has been bugging me about my hopsack jacket from Elia, it probably seems silly to you but here goes………..The fit is spot on, when I have my arms at my sides in the usual instagram pose (!) the sleeve head where the spalla camicia folders are, sits perfectly. Is this supposed to deform and ‘kink’ when for example you raise your arms etc? It would be very helpful if you had a video or images of the jackets and how they change when you move. Thank you Simon. I hope you didn’t think that was too idiotic a question, I’ve come to sartorial appreciation a little later than most and many of the examples of good fit are touted on instagram and other social media sites. Obviously most are staged and you never see movement so it’s tough to know what is ‘right’ or ‘wrong’ in terms of fit. Sorry to keep asking you the same question but I need you to put my mind at ease: I’ve had two SB jackets made by Elia and one by Luigi Solito. I love Elia and his work but I did notice a difference between the two. On their recent visit to London I let Luigi and Luca examine my Caliendo navy hopsack SB. Luigi said that it was very well made with a very clean chest and back but that it was in his opinion very old fashioned and typically neapolitan, something that his father would make as a matter of course, but he didn’t like it at all with all due respect to Elia. Luca added that luigi also made higher armholes and longer roll and position of lapels. Do you agree with this assessment? I thought Elia made a really superb jacket but Luigi has confused me a little. Do you think Elia makes the armholes high enough so that there is little distortion in the body of the jacket when making big arm movements? By the way, when will you be doing an article on the pitti suit Elia made for you? Thank you for all your help Simon, yours is by far the most useful, thoughtful and honest blog on the internet. Thank you for taking the time and trouble to answer my rather nitpicking questions Simon! Hi Simon, what is the weight of the fabric used for the trousers ? Hi Simon, Great insight and very informative! Just wanted to know your thoughts on what fabric would be good for an “all around” versatile sports jacket. I am thinking of getting navy and grey but I want a fabric that will go well with all of the following: (i) wool suit trousers (ii) jeans, (iii) cream chinos, (iv) mid grey flannel trousers etc. I know some people who have navy sports jackets but they are in various fabrics depending on the season (i.e. linen for summer, tweed, flannel for winter etc.). I’m essentially looking for a fabric that I can match with the various aforementioned trousers. If you want it to go with denim, you’re looking at the more casual materials – tweed or donegal patterns, which can be rendered in real tweed, wool or even cashmere. Navy is the smartest and will struggle to go with denim, as the most casual of the trousers you list. I’ve had Elia make me a few jackets but I am now looking for a navy cashmere jacket for my next bespoke piece, something as versatile as your navy solito jacket. Something to be dressed up or down, with and without a tie and worn mostly with different shades of grey, green and cream trousers (but not denim!) What shade would be best, lighter or darker for it to be most versatile? I’ve had a jacket made in 400g tweed, a beautiful glen check. Do you think a jacket of this weight could be used in autumn and spring or is it approaching the heaviness of a coat? Also what does this weight do for drape and fitting? It should be ok for some autumn and spring days, but not all. The weight will be good for drape, but weight isn’t the only factor – eg if it is a spongey tweed it will not hang as well as something smoother. I just re-read this post since I am getting a jacket made in oatmeal a decision which has been largely inspired by your post! Cloth I have chosen is Loro Piana 368645 (330 gr 100% cashmere) from their Woolen Jackets bunch). Question I wanted to ask was – which colour did you choose for the body lining? I am thinking of going with dark brown for the body lining – the buttons will also be dark brown horn. Hi Simon, I’m a regular reader of your fantastic site and as a result will be finally biting the bullet by having a jacket made with Elia Caliendo. I’m really quite inexperienced with menswear, have certainly never had anything bespoke before, so am quite nervous about getting this significant decision ‘right’! I’m after a non-navy jacket made in either a tweed or cashmere, to wear with jeans/grey flannels/ olive chinos for as much of the year as possible. 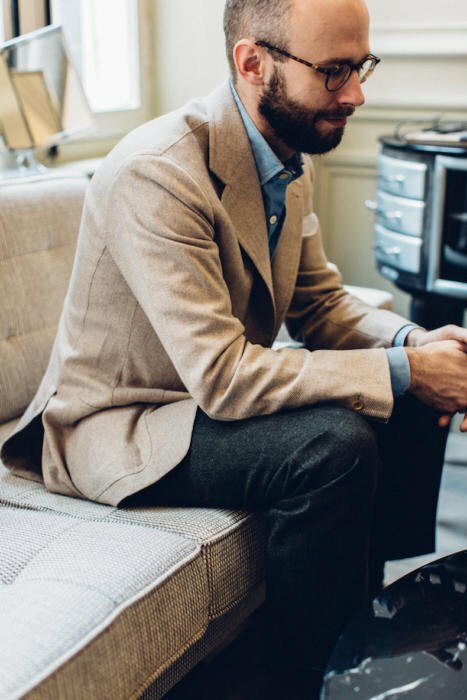 I am really keen on your grey/brown jackets like this one and the Permanent Style Tweed… Is there a particular couple of choices of brown/grey donegal cashmere that you would recommend? Inspired to ask you by other readers’ comments (Kashif, KC) also looking for a jacket alternative to navy. Thanks. I wouldnt worry too much about skintone, the bigger risk is lighter skins being washed out by this kind of jacket. Thanks Simon, really helpful advice. Are there any other specific Donegal cashmeres or tweeds in this sort of grey/brown palette that you might recommend readers to opt for? I wondered if you keep a selection in mind. In your jacketing post you mention how hard it is for the inexperienced to visualise the final article from the small swatches – I’m certainly suffering that! Thanks Simon I’ll have a look. What’s your opinion on a marled textured appearance? Might this help make a piece more urban/modern or suitable for younger men? I am considering a similar jacket and my taylor offers me Sherrykash, tan birds eye with a mix of 90% wool and 10% cashmere. Would it be a nice alternative?. Having the basics covered (and some “mistakes” as well), I am looking at commissioning my next odd jacket. I love the idea of oatmeal, but previously had thought about something more similar to the brown/rusty colour, similar to your Caliendo jacket. Overall, i would like to know whether which you wear more often, which is more versatile? My usual trousers are grey and rather earthy tones, together with blue. Also, what is your opinion on cacciopoli cloth, which I am eyeing for the jacket above (320gr. Donegal cloth), if I may ask? Why can’t gray jackets be worn with gray trousers? Is it a “false suit” issue, or something else? It’s something I’ve written about a fair bit before. Simon, I just have a question. You say a gray sports jacket cannot be worn with gray flannels, but does that hold true if the jacket is light gray and the trousers mid-gray? Sorry, late to the party on this one. Your jacket here was made by Neapolitan tailor Caliendo, but the shoulder doesn’t show that traditional Neapolitan bunching and extra fabric that makes the giacca alla camicia, if I’m getting the phrase right. What am I missing? Firstly just want to say that I am a massive fan of your website and have been following it closely for a few years now. I am really interested in commissioning an oatmeal jacket but I am not sure of which material I should go for. Ideally I would like to wear the jacket in the office and would want something not too casual. Would a wool/silk/linen with a loose weave be too casual? Or should I go for something like a cashmere or flannel. I would like to thank you in advance Simon! Thanks Simon for your kind help. Will take your suggestion into consideration. I’ve been combing through your entire look book looking at the different Neapolitan shoulder expressions and noticed that there each tailor has their own interpretation of the Neapolitan shoulder. My favorite would be the shoulders from Elia Caliendo – unlike most Neapolitan tailors, he doesn’t embellish the shoulder with puckering and pleats. Instead, he does a true shirt shoulder construction with a visible shoulder seam that truly looks just like a dress shirt shoulder. I, like many others, dislike the pleated sleevehead + rollino effect look as I feel it is too flashy. In the post, he says that a pleated sleevehead and a shirt shoulder construction can be mutually exclusive and are two separate things. For people who like a neater look, Manton says that it is possible to retain the fullness through pressing open the shoulder seam. Am I correct to say that Elia employs a shirt shoulder method, and not a pleated sleevehead? There might be very subtle wrinkling but definitely nowhere as showy as other tailors I’ve seen. I’d like to hear your thoughts on the Neaplitan shoulder, thank you! Hi Bernie. Manton is right, they are very different. Having a shirt shoulder construction doesn’t mean you have to have that extra fullness at the top of the sleeve that causes the ripples. Others do this less too: Pirozzi, Zizolfi, Ciardi and Panico for example. It is the more traditional Neapolitan style. Looking forward to the continuation of your Tailors Style series as I’d enjoy a much more in-depth and detailed look at shoulder expression and other nuances. For Elia, how would you describe his shoulders? For me, I don’t like the pleating and puckering in the shoulder seam but quite like the subtle and natural wrinkling in the sleevehead/bicep area. Your caliendo jackets seem to achieve fulllness in a different way compared to the pleated sleevehead approach. They seem so natural yet soft with fullness. I’m about to commission a bespoke jacket and I’d like to know Elia’s shoulder expression so I can hopefully emulate it, thanks! To achieve that natural, full look, does Elia press open the interior shoulder seam at the top to smooth out potential puckering and prevent roping? I read that if he presses open the seam to smooth out the shoulder, the fullness and excess cloth is forced down into the upper arm/bicep area. I would quite like that effect, as you’ve pointed out many times that bigger sleeves makes you look more masculine (your blue star AS jacket is the best example in my humble opinion). Is this effect of transferring fullness what you meant by working the fullness underneath the sleevehead? In my eyes, his shoulder is the closest to a true shirt shoulder sans pleated sleevehead out of any other Neapolitan tailors you’ve used. How he manages to still incorporate fullness in a natural way is just miraculous to me, and I truly respect his work. I read that such a construction requires a top stitch, hence why you see visible pick stitching close to the seam on Elia’s shoulders. I’ve seen tailors actually emphasize that topstich with a swelled edge for stylistic effect as well. Whether it was done via machine or hand does impact how pronounced it is. Manton says that the tell-tale sign of a spalla camicia is that there appears to be a ridge on the shoulder side…Because there are three layers of cloth on the shoulder side but only one on the sleeve side. This creates the fluting or rainfall effect, which is separate and distinct from the puckering from excess fullness. Is that correct? Lastly, Elia uses no padding/wadding in the shoulders, right? Or does he use a little at the edge to create a slightly extended shoulder to allow a little more fullness (just like Saman Amel did for your LP MTM jacket)? Thank you for answering my barrage of questions – ever since I’ve read your writing I’ve gone from buying off the rack at SuitSupply to planning a bespoke commission. I’m 24 as well, the same age you embarked on your sartorial journey. Thank you for your guidance, I really appreciate it! PS – looking forward to receiving my first ever purchase from the PS Store – my first Finest Knitwear crewneck! – No he doesn’t press open the shoulder seam, but that doesn’t really affect the bicep area or roping. Roping comes from the sleevehead wadding and cut of the sleevehead. Think of them separately to the shoulder. Fullness is not pressed down from shoulder to sleeve either. – Yes, Manton is right. Thank you for the explanation, Simon. Lastly, in terms of canvas, do Neapolitan tailors like Elia use a special lightweight canvas in a certain material like wool? And do they use multiple pieces of canvas or just a single chest canvas? Elia and Dalcuore have a distinctly soft look that is very expressive, which I admire very much. When I meet my tailor next week, I’ll tell him that I want a classic sleeve with the fullness fed more into the bottom of the sleevehead instead of the top to avoid the puckering/pleating on top that is so prevalent. Bernie, I would warn you against trying to change what your tailor has been trained to do too much – a simple instruction like that isn’t necessarily enough, and won’t necessarily produce the effect you want. Suggest it to him, show him the end result ideally, but then don’t rely on getting exactly the same thing. Just perhaps closer than what he ordinarily does. So many tailors tell me stories of tailoring enthusiasts going into them, trying to tell them how to cut a sleeve, even showing them a pattern. It’s rarely enough detail. And even if it is, it won’t necessarily come out right – just as that tailor’s first attempt to do something when he first started didn’t necessarily turn out right. Plus, of course, doing something anew will take a lot more time so you’re asking him to do a lot more work for the same price. On canvas, Italians use a lightweight canvas, usually linen or wool, and some use a small amount of horsehair too, some don’t. Thank you for wisdom – I will definitely temper my expectations and keep your words in mind. Looking forward so much to your coverage of the Neapolitan tailors like Elia in your Tailor style series to get an in-depth look of how the tailoring houses achieve their look and the subtle, yet distinct differences between them. The most stunning example of a grey jacket w/trousers is Cary Grant in “To Catch a Thief”. He’s wearing a grey blazer (3 roll 2 if memory is correct) with stone trousers cut rather full together with a white shirt and ascot. Dame, he looks great in that outfit! Scenes shot in South France. What are your thoughts on Loro Piana’s Pecora Nera Blazer Fabric: N686030? Thinking about it for my 2nd/3rd SC (already have navy blazer). It seems to be a mix of grey and beige. In terms of versatility, is it between grey and pale brown or is it less versatile because it is a mix? Seeing as how you recommend a light sand/oatmeal for the 2nd or 3rd SC, I want to hear your thoughts on these two fabrics to see if they were good candidates, thanks! It seems like all your Caliendo pieces have an extended shoulder effect even though they are traditional shirt-shoulders. Heavily reminds me of the extended shoulders on the LP Saman Amel jacket you had in your review. Is it due to padding, and if so, would it be possible to have an identical looking shoulder with no padding? There’s a tiny bit of roping in there yes. And no, you’d need to put something in there otherwise how would you create it? I see now, thank you. Compared to Solito’s bald shoulder, I prefer Elia’s as it looks like a natural shoulder with more softness and creates a better V shape with the slight extension. It is very subtly done. Amazing what a little padding & roping can do when combined with the spalla camicia!